The pair of G-series chip ranges each consist of an eight-generation Intel Core processor alongside a custom Radeon RX Vega M GPU, connected together with eight PCI Express Gen 3 lanes. Next to the GPU is 4 gigabytes of High Bandwidth Memory Gen 2 (HBM2), which is connected to the GPU via Intel's Embedded Multi-Die Interconnect Bridge (EMIB) technology. The lower-specification model will use a Radeon RX Vega M GL GPU with base and boosted clock speeds of 931 and 1,011 megahertz respectively, and 20 compute units. Paired a quad-core Intel Core processor clocked at up to 4.1 gigahertz with up to 8 megabytes of cache, the entire package will have a thermal design point (TDP) of 65 Watts, making it highly suitable for mobile systems. The second version opts for a Radeon RX Vega M GH GPU, with 1,063 and 1,190 megahertz base and boosted clock speeds, 24 compute units. A similar quad-core processor with the same cache will be included, albeit with a higher clock speed of up to 4.2GHz, with a TDP of 100 Watts, though Intel plans to ship this model with an unlocked CPU, GPU, and HBM2, making it an option more attractive to those wanting to overclock the package. 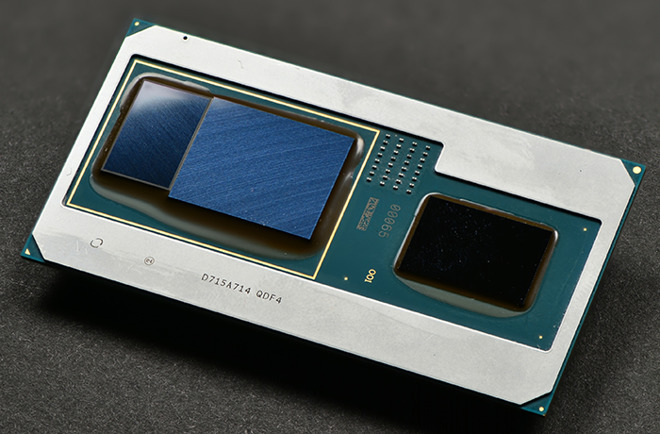 It is claimed the combined processor and GPU takes up less than half the footprint of similar discrete components, and has the potential to significantly slim down notebooks. Intel gives the example of three-year-old notebooks weighing nearly 7 pounds, measuring more than 32mm thick, with only four hours of battery life, while newer models using this style of chip could be under 17mm thick and run for up to eight hours on a single charge. Intel claims this setup is capable of providing triple the frames per second compared to similar systems released three years ago, and offers a performance boost of around 40 percent compared to current discrete graphics options. It is suggested these chips would be ideal for VR enthusiasts, with them capable of providing the processing power required for VR and mixed reality headsets. As a demonstration of the new processors' usefulness, Intel also launched a new NUC, formerly codenamed "Hades Canyon," which uses the announced processor in a compact 1.2-liter volume system. Despite the small form factor, Intel claims it is still capable of running VR content, and would be usable by content creators with high workload requirements. Notebook vendors using the new chips have yet to be confirmed, but are likely to be announced during CES. Pricing and availability are also similarly unknown at the time of publication, but initial hardware may ship by the end of the first quarter of 2018. As usual, it is uncertain as to whether Apple will take advantage of the new chips in the Mac mini, or in future MacBook and MacBook Pro releases. The current 15-inch MacBook Pro includes discrete Radeon GPUs alongside the integrated Intel HD Graphics 630, so using the launched processors could well be an attractive proposition.